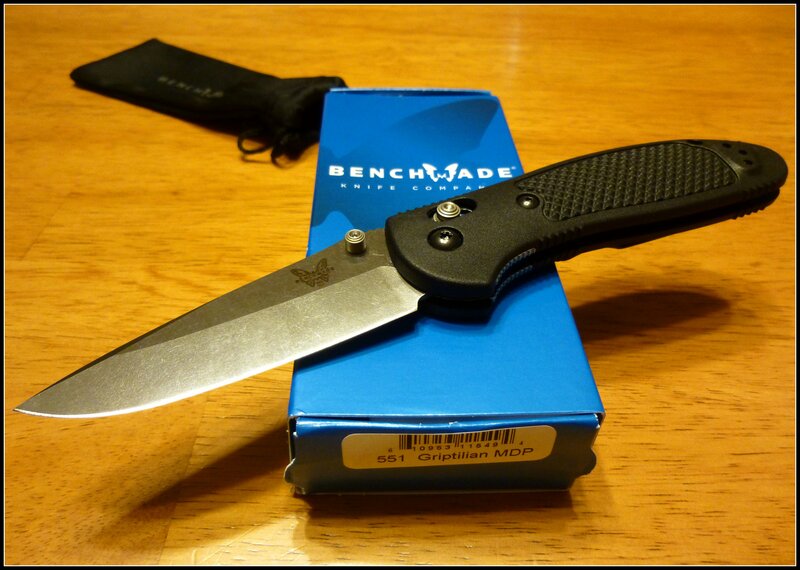 A while back I had come across the Benchmade Griptilian knives, but to be honest, the price turned me off, pretty quick. However, after listening to both Brian and Joe talk about their own Griptilian’s, I decided to give them another look. Then, long story short, I found one on Amazon for $78 + free shipping. It just so happened that I had that amount of $$ to spend on “backpacking gear,” so I thought to myself, why not? Since I ordered the Griptilian, I have watched multiple YouTube videos as well as read lots of different reviews on this knife… all in anticipation of its arrival. Then… it finally came in the mail today! As I said already, I have never really carried an EDC knife with me until just a couple of years ago, so it is safe to say, I am not a huge knife critic. To be honest, at this point, I cannot break down all the aspects of a knife, the materials it is made from and the scales that are used to compare them by. So, rather than try to break it all down, I will simply post some of the details from the website and the features that stood out to me. Handle: NORYL GTX®: A modern engineered plastic offering high-strength, minimal flex and optimally lightweight properties. Molded to form. There is a hole for a lanyard included in the handle (although, I will not use this). Locking Mechanism: AXIS® A patented Benchmade exclusive, AXIS® has been turning heads and winning fans ever since its introduction. A 100-percent ambidextrous design, AXIS® gets its function from a small, hardened steel bar which rides forward and back in a slot machined into both steel liners. The bar extends to both sides of the knife, spans the liners, and is positioned over the rear of the blade. 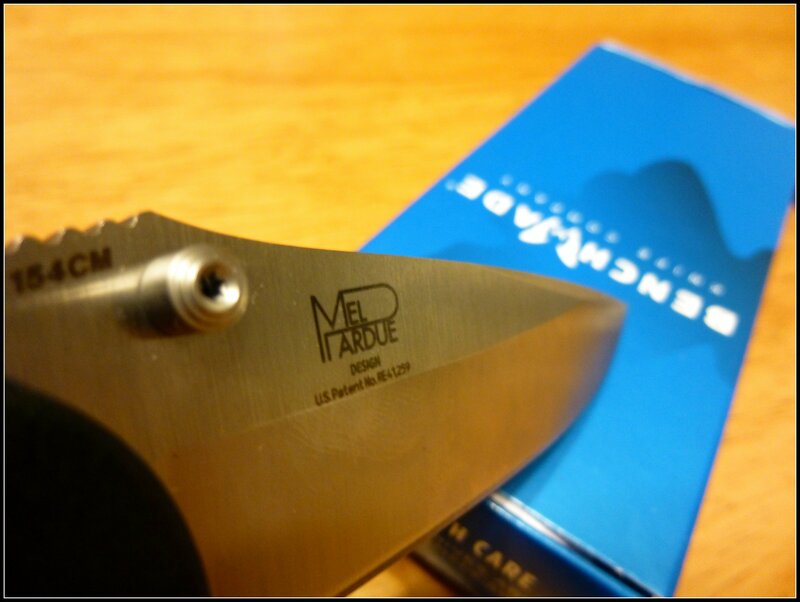 It engages a ramped, tang portion of the knife blade when it is opened. Two omega style springs, one on each liner, give the locking bar its inertia to engage the knife tang. As a result, the tang is wedged solidly between a sizable stop pin and the AXIS® bar itself. Available in manual, assist or automatic configurations. Blade: 154CM: An American made premium grade stainless steel originally developed for tough industrial applications. Known for its best all-around qualities, it offers great corrosion resistance with good toughness and edge quality. As I mentioned in the video, I do have a mod planned for this knife. It is a simple one, although I have yet to do it (so sorry, no pictures just yet). I plan to remove the pocket clip and then to remove the black paint and then to polish it so that it has a simple stainless steel finish. Why, you ask? In many of the reviews and videos I came across when “researching” this knife, many had complained that the black paint chips off very easily and quite quickly, even with simple use. So, a number of reviewers have simply removed the black paint and then polished it up. This makes it a bit more “bling-y,” rather than the more appealing duller, black finish, but if it chips so easily, I would rather just skip to the end result. So, in the next few days, depending on work, I will work on getting this done and will post more on it then. Welcome to the world of serious knives. Congratulations on your purchase. I hope this knife is still serving you well, it is the one I use for EDC. I carried it in the military as well. Personally I prefer the half serrated style, and I predict if you ever get a half serrated blade you will never go back to a full smooth knife.